… and here I am, behind in my posting again. We have been busy getting out orders and now I have lost my loom room where the big rug loom has been living. I think I have found a new home for it but I still have my monstrous yarn stash and assorted other things to find new homes for. But meantime… the potted garden is doing beautifully. Witness the elegant eggplant! It sets in a tall metal stand at the corner of the deck. The tomatoes are in even larger pots at the foot of the deck. They have more of an insolent sprawl, lounging over into the deck on one side and the deer fence on the other. The pot of green peppers is tidy and green and well behaved, but they are all producing very well. I even have two small pumpkins on vines which are creeping across the lawn. Himself mentioned today that the grass under them needs mowing. Not sure how we’re going to accomplish this with everyone intact. I hope your September is prospering! 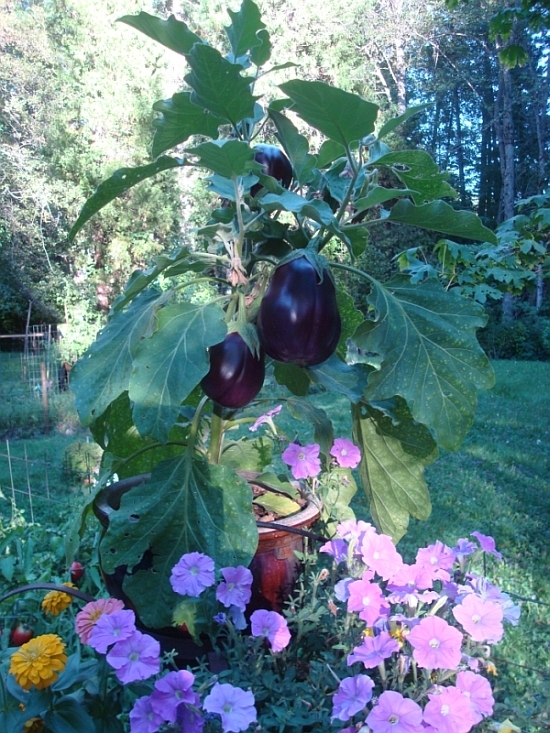 I have never seen an eggplant plant that big before, you must be fertilizing it well! I can’t believe it’s September already!